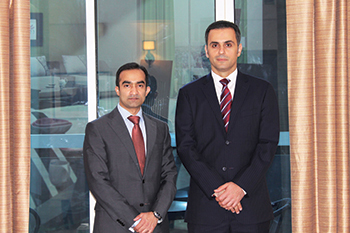 Mithaiwala with Jubran Abdulrahman, managing director, Hilal Conferences and Exhibitions. The award-winning real estate agency will demonstrate how it is raising the bar for exclusive residential real estate projects in Bahrain as it showcases Juffair Heights, recently voted the ‘Best high-rise residential development’ at the Arabian Property Awards – as well as upcoming projects in Zinj and other parts of Bahrain. Juffair Heights is a twin-tower freehold residential project currently under construction and expected to be completed in mid-2016. It comprises 376 one, two and three-bedroom units within the 28 and 29-storey twin towers. Announced last April, the project has already generated a great deal of interest, particularly among Arab and other expatriates living in Bahrain and neighbouring countries. Construction continues at a rapid pace on the project, which is reported to be ahead of schedule – without compromising build quality and contractor safety – boasting 460,000 accident-free man-hours at site. Also on display will be the under-construction Galleria project, a boutique mall in Zinj with a gross leasable space of 19,000 sq m, which is expected to see completion by this year-end. Pegasus has previously exhibited at the show when it struck some deals, according to Hisham Ismail, the company’s manager operations and business development. Pegasus Real Estate, which employs a total of 25 staff, was established in 2005 and is located in Bahrain’s Seef district. Some of the services provided by Pegasus include exclusive representation, property management, facility management, finance/mortgage, consultancy and approval, portfolio management, development consultancy, international sales, interior consultancy, and letting and relocation. Ismail says business has been on the rise since the beginning of 2014 and “encouragingly higher compared to 2012 and 2013”. He adds the company is currently working on establishing an office in Saudi Arabia to broaden its outreach. Pegasus has also installed a new property management system by the UAE-based Go Masterkey. “The system allows Pegasus to professionally manage and promote the properties managed and marketed by the agency on behalf of its clients,” explains Ismail. Pegasus Real Estate can be visited at Stand GP80 at the Gulf Property Show.